There are number of infections which affect the different organs like skin, thorat, genital area, stomach, esophagus etc. The most common species of candida is Candidia albicans which is most common yeast infection. Normally it is found on overall body in small amount but its overgrowth results in yeast infection. 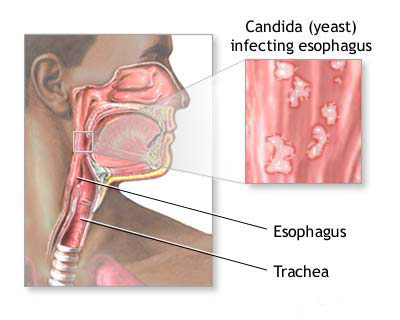 Here we discuss about the Esophageal Candidiasis which is fungal infection of esophagus. This can be managed with the help of Ayurvedic treatment. Ayurveda mainly treats the root cause of disease to balance the healthy body. It is fungal infection of the esophagus which is caused by the Candida Albicans. It is commonly seen in patients with HIV and patients who have weak immune system. The treatment of this infection is very important at the early stages because if it lefts untreated it may damage the major organs of the body and it may cause death at the severe stages. Difficulty in eating food and liquids. Weight loss due to inadequate intake of food. White patches appear on tongue, mouth and lips. The patients who suffer from Cancer, HIV, diabetes, chronic infection are at higher risk of this infection. Long term use of anti-biotic may leads to weakness of immune system which can lead to this condition. Medicines- antibiotics use to kill harmless bacteria and fungi. Disease condition- diabetes, pregnancy or any other medical complication. It is immunity disorder which is caused by deficiency of OJA as per Ayurveda. OJA is immunity power of the body which provides the energy to fight against infections. The main cause of it is Agnimandya or indigestion. Due to indigestion, accumulation of toxins (ama) occurs in body which is the main cause of any disease as per Ayurveda. These toxins may enter into the blood stream that cause toxicity and results in disease condition. This results in vitiation of vata dosha in body and is responsible for infections. Generally it involves vitiation of all three doshas i.e. vata, pitta and kapha in body. Ayurveda is ancient system of medicine which helps to restore the energies of the body with the help of herbs, diet and lifestyle recommendations. The infection may be chronic in nature and if it is left untreated it may spread systematically. There are number of factors like imbalanced diet, low digestive fire, ama, low ojas and lifestyle factors etc that are responsible for this. Ayurveda mainly involves the two strategies in the treatment of Esophageal Candidiasis - to reduce the toxins and restore the immunity of the body. 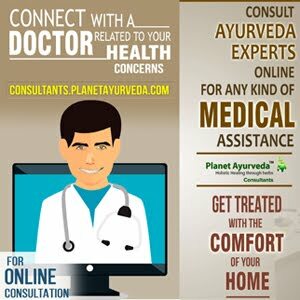 With the help of Ayurveda one can manage the disease condition. 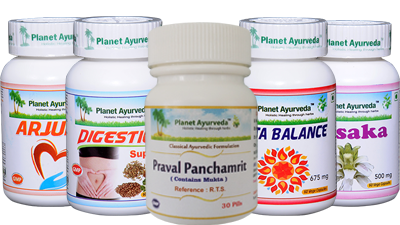 Planet Ayurveda offers different formulations for the treatment of Esophageal Candidiasis. These remedies help to reduce the symptoms of this disease. These herbal capsules are prepared from the pure extract of Arjuna (Terminalia Arjuna). Arjuna (Terminalia arjuna) - Terminalia arjuna belongs to family combretaceae and is native to India. This herb has great medicinal properties and helps to balance the all three dohas. It is useful in various infections. Dosage:- 1-2 capsules twice in a day after meals with plain water. Benefits:- These ingredients are useful to balance the pitta dosha and have cooling effect on body. It contains giloy which helps to enhance the immunity of body. It provides the strength to the body to fight against infections. Dosage:- 1-2 capsule, two times in a day after meals with plain water. These are herbal capsules which are useful to maintain healthy digestion. These capsules are prepared from different herbs. Benefits:- These herbs are packed with properties which are able to maintain healthy digestive system. . It also increases strength of digestive fire (agni). As it provides relief from indigestion therefore it provides relief from this infection because it is the main cause of Esophageal Candidiasis. Dosage:- 1-2 capsules twice daily with plain water after meals. These capsule are prepared from the standardize extract of Adhatoda vasica. Vasaka (Adhatoda vasica) - It is also called as Malabar nut. It balances the pitta and kapha doshas in body. This herb possesses the various therapeutic properties which help to manage the disease condition. Dosage:- 1-2 capsule twice daily. It is herbo-mineral preparation which is useful in treatment of different disease conditions. Use of this medicine is quite beneficial in case of digestive problem. It improves the digestive fire in the body. Dosage:- 1-2 tablets twice daily. One should follow the proper diet, regular exercise and sleeping habits. To gain strength and immunity one should follow the good diet.